At long last we are getting some answers in Brian Michael Bendis’ over-wrought Uncanny X-Men saga, yet for every smart or interesting moment there is a boring or inexplicable one. 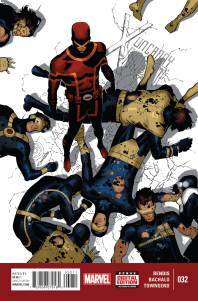 Scott Summers has made up his mind to bring an end to his mutant ‘revolution’ and some of what follows is strong character work, even despite the ultimately anti-climactic nature of the narrative. At least Chris Bachalo is on hand to make every single panel look characterful, complex, and unique. This entry was posted in X-Men and tagged beast, colossus, cyclops, ice man, jean grey, magik, storm, xmen on April 2, 2015 by lowbrowcomics.